Emeline Canessa in front of her two screens showing the boreholes and their content. The big machines have arrived. Rock-crushers and huge scrapers dominate the scene, signaling that the ITER construction is well underway. For the Department of Civil Construction and Site Support (CCS), this clearly means all hands on deck. But before it comes to pumping concrete into the ground, it is useful to get an idea of its geological composition and structure. 112 boreholes have already been sunk all over the ITER construction site between 1995 and 2007, making the map that Emeline Canessa has on her computer screen resemble Swiss cheese. The job of the 29 year old "Geomaticien" from Aix-en-Provence is to establish the tools for the Geographical Information System that connect the plans of the ITER site with the geological data and photos collected over the years. With just a mouse click on borehole number 13, the engineers and architects will not only get the analysis of its geological composition but also a visual impression of the bore cores down to depths of up to 60 metres. 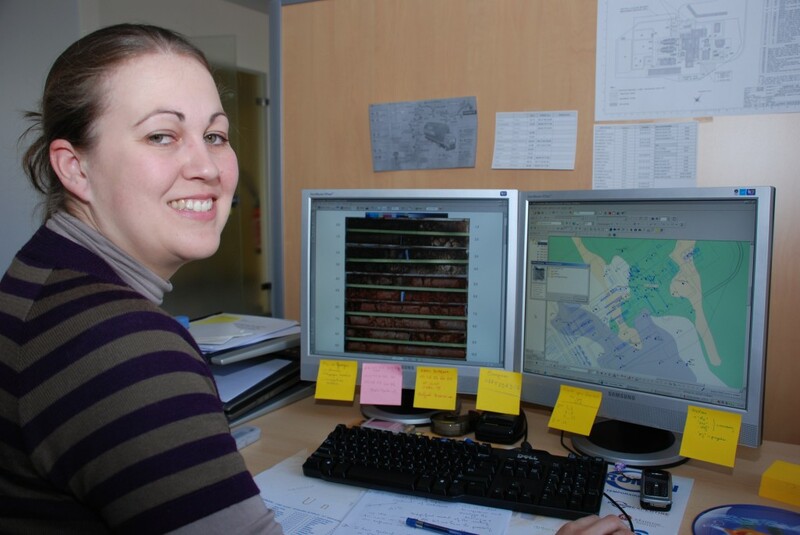 Before Emeline joined the ITER project as temporary staff, she worked for the "Canal de Provence" setting up the Geographical Information System for the construction of the water supply from the Verdon River to Lac Saint Cassien. Water - water consumption in the Algerian desert, to be more precise - was also the topic of her Master's thesis — and will be the subject of her PhD thesis she plans to finish this year. If you think that all this sounds time-consuming, talk to Emeline. In the near future, she wants to establish another helpful tool: a photo-documentation of the ITER construction linked to the various buildings. So, with one mouse click you would not only be able to look down into the deep, but also see the buildings — one by one - rising out of the ground. "It is so thrilling to be part of this," says Emeline, raising her eyebrows. "Growing up in Aix, I have heard all the expectations about the ITER project. To see it finally being realized and to get the chance to be part of it is exciting."